Recently we took a family vacation to visit our dear friends’ home in Arizona. It was Jamisen’s first time on an airplane, so I wanted to be prepared for the (thankfully short) amount of time he’d be cooped up on the plane. 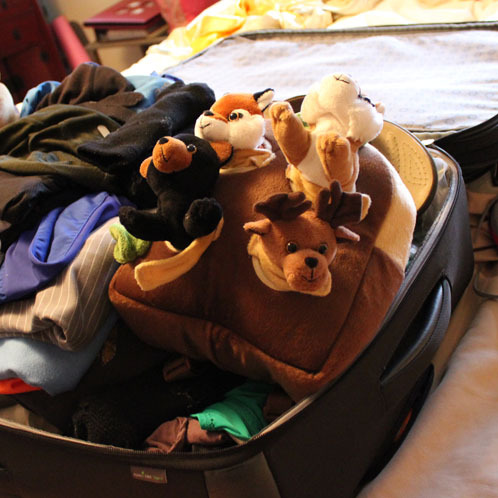 I found a ton of inspiration for making a travel activity bag on Pinterest (where else?) and was super excited to create a personalized version just for my little man! 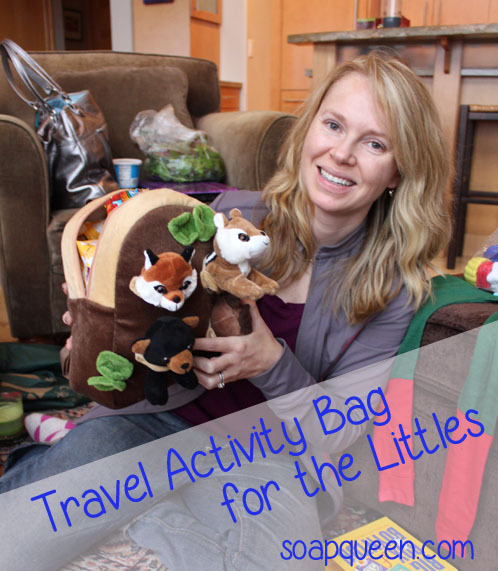 I read that for all the effort you’ll put into these bags, it’s likely that your toddler will only spend between 10 and 20 minutes with it, no matter how crammed full of activities it is. I definitely wanted to get the most out of it. So, first step was deciding what to put into the bag. I went to the local art store and the local scrapbooking store for most of the contents of the bag. I wanted to get some new things, things Jamisen had never seen, in the hopes that they would keep his attention for longer. Plus, a lot of stuff I picked up made a wonderful addition to our art cabinet after the trip! I mixed the new items with familiar things from home for comfort. 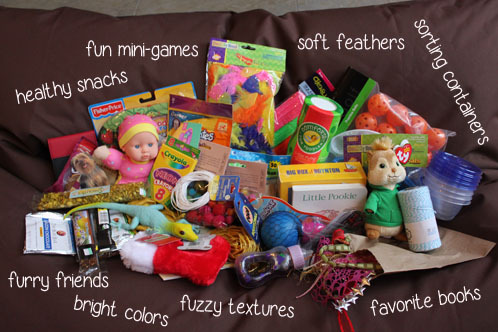 You can put this in a shoebox, a back pack or a little activity pack that our dear friend Linda gave us with happy stuffed animals coming out the top of it. You can get your own here. Don’t be afraid to make your own toys! I created a super fun series of animals and other easily recognizable items on sticks with just some cutouts (from the scrapbook store), hot glue, and popsicle sticks. Another fun tip: WRAP EVERYTHING. Paper, string and even pipe cleaners offer precious extra time in order to access desired toys and activities. These sorting containers and giant buttons were just the thing to be wrapped up with some leftover holiday wrapping paper. Bonus, these little containers are perfect for holding snacks during regular outings! We tried not to use any tape; just string. That took longer to unwrap on the plane. 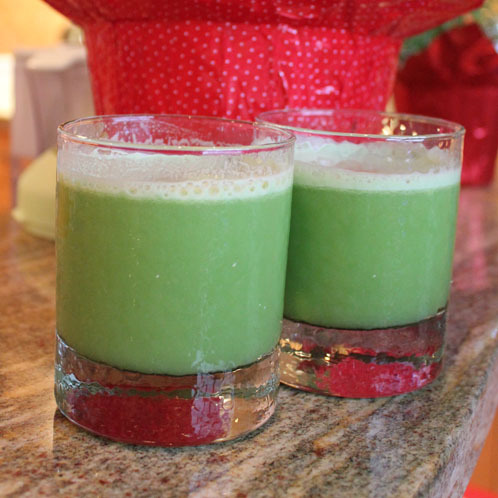 OPTIONAL: Pause for some delicious and healthy green juice. I love these recipes if you need some inspiration. Yum! Okay, next up is another sorting activity using fun, fuzzy, felted balls. They are lightweight, compact, brightly colored and come in different sizes. This uniquely shaped container I found at the art store was perfect for holding them all. We now use these balls at home for sorting and talking about colors. 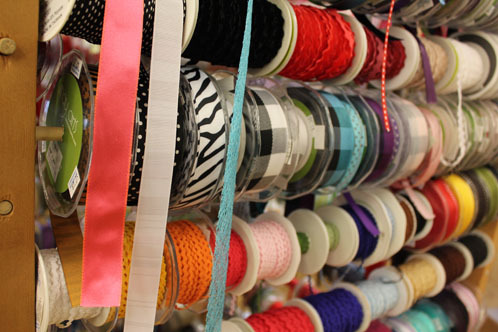 There was a ribbon smorgasbord at the scrapbook store! Taking one of Jamisen’s sippy cups I created a tactile wonderland by using different textured and sized ribbon. I pulled different ribbons through the holes in the lid, tied them all together with a knot on the back of the lid, and put the lid back on the cup. We used the OXO cup with the ‘training cup’ lid for this project. Last but not least, and this is important: do not spend all that time perfectly personalizing your travel activity bag just to leave it at home. =) Make sure it comes with you! Happy travels! Nifty Cupcake Carrier Brotherly Love Soapy Social Media Roundup Vocation Vacations Skiing Today! Isn’t that all kids on a car ride? =) I definitely agree having a kid-friendly activity bag is solution for many of those longer car rides. also, both on mine have a trunki (www.trunki.com) to put their stuff in. Those things are super handy on the airport, plus spacious enough for a change of clothes, snack and toys! I would have been in soo much trouble with all that stuff flying with my two, crawling on all four in the plane hunting for fallen balls, buttons and whatnot! We stick to books, notepads and coloured pencils. I travel 12-14hrs (three different 2-3 hour flights) with the kids twice a year, and the books and drawing things, together with their favourite toy and “plane pillow” has always been more than enough. They’re now 3 and 4 and pretty used to traveling.